Andre Berto edged Devon Alexander by split decision (115-112, 114-113, 115-112) in a matchup of former welterweight world champions. The father of world champion Andre Berto passed away December 29 at the age of 60. Champions Shawn Porter, Errol Spence Jr. and Keith Thurman, former titleholders Andre Berto, Adrien Broner, Luis Collazo and Danny Garcia, top 147-pound contenders Jamal James and Yordenis Ugas and unified lightweight champion Mikey Garcia all discuss their eagerness to face one another for welterweight glory. 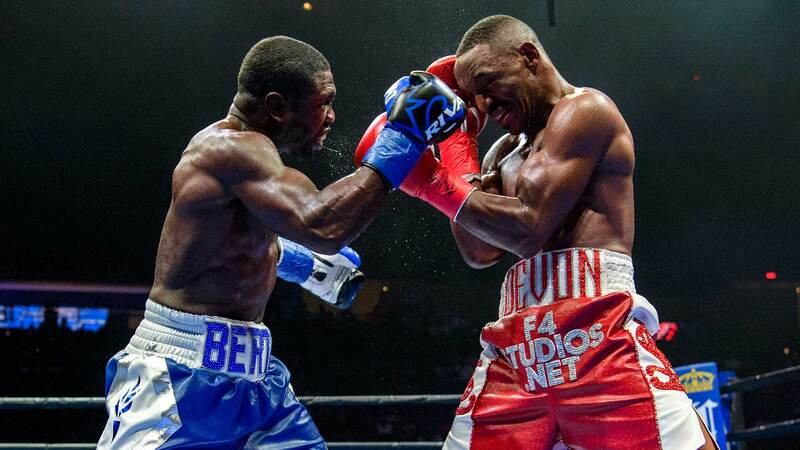 Andre Berto has been dominating in the ring ever since his father introduced him to boxing as a child. Following an impressive amateur career, the Florida native became a world champion at 147 pounds. After losing his title, though, "The Beast” is hungrier than ever to reclaim his spot atop the division. Berto wasn’t born in Haiti, but his heart lies in the troubled country from which his family emigrated in 1980. Andre Berto fights Xavier Noel of France in a 152-pound match at the 2004 Olympics in Athens on August 15, 2004. For Berto, boxing started as a way to stay out of trouble, but he quickly showed his skill in the ring. He was a national Golden Gloves champion in 2001 and 2003, a three-time U.S. Amateur Championship medalist and won a bronze medal at the 2003 World Amateur Championships. He also won 22 state titles in Florida. Berto entered the 2004 Olympic trials as the top-ranked American in the 152-pound division, and seemed a lock to make the Olympic squad, but he was disqualified in the fourth and final round of his opening bout when he shoved opponent Juan McPherson to the canvas. Berto won a protest and was declared the winner, advancing to the next round, but USA Boxing officials reversed the ruling, eliminating him from the tournament. Berto then was allowed to compete for Haiti in the Olympics, but lost in the first round to Frenchman Xavier Noel. Andre Berto lands a right hook against David Estrada during their 147-pound fight in Atlantic City, New Jersey, on September 29, 2007. Berto made his professional debut in Little Rock, Arkansas, in December 2004, gaining a third-round technical knockout of Michael Robinson. He knocked out 13 of his first 15 opponents, and after gaining a sixth-round TKO of Miguel Figueroa in December 2006 he was named ESPN.com’s Prospect of the Year. The hard-hitting Floridian continued his climb through the 147-pound division, winning tough bouts in 2007 against Norberto Bravo of The Contender, Cosme Rivera and David Estrada. Berto got his first shot at a world championship in June 2008, when he fought Miguel Angel Rodriguez for the vacant 147-pound title in Memphis, Tennessee. Berto won the belt with a seventh-round TKO, knocking Rodriguez to the canvas twice in the final round before the referee stopped the bout. Berto won 12-round unanimous decisions in his next three fights—against Steve Forbes, Luis Collazo and Juan Urango—to retain his title. He was to defend his belt against Shane Mosley in a 147-pound unification bout in January 2010, but withdrew after a mammoth earthquake hit Haiti that month. With an uncle and seven other family members killed in the disaster, Berto and his brother Cleveland joined a group called Project Medishare, which brought doctors and medical equipment from the United States, and flew to Haiti four days later to help in the relief effort. "It was all dust and rubble," Berto told the Los Angeles Times in 2011. "There was house after house, just crushed to the ground. It felt like I had walked into a war zone. It was a nightmare, a completely different place." Andre Berto closes in on Freddy Hernandez before gaining a first-round TKO during their 147-pound title bout in Las Vegas on November 27, 2010. Berto returned to action in April 2010, gaining an eighth-round TKO of Carlos Quintana in Sunrise, Florida. He then gained a first-round TKO of Freddy Hernandez in Las Vegas in November 2010 for his fifth consecutive title defense. Berto suffered his first professional defeat and lost his belt in April 2011 when Victor Ortiz won a 12-round unanimous decision in Mashantucket, Connecticut. The Ring called the action-packed bout the Fight of the Year after Berto was floored in Round 1, Ortiz was dropped in Round 2, and both fighters went to the canvas in Round 6. Following the loss, Berto fought Jan Zaveck for a world title in Biloxi, Mississippi, in September 2011. Berto emerged as a champion once again when Zaveck’s corner stopped the fight after the fifth round because the Slovenian’s right eye was badly swollen. Andre Berto punches Jesus Soto Karass during their 147-pound bout in San Antonio on July 27, 2013. Berto relinquished his belt instead of facing mandatory challenger Randall Bailey because he wanted to avenge his loss to Ortiz. The rematch was planned for June 2012, but was canceled a month before the bout. In his return to the ring, Berto lost a 12-round unanimous decision to Robert Guerrero in November 2012 in a bid for the vacant 147-pound title. He then lost by 12th-round TKO to Jesus Soto Karass in July 2013 after knocking him down in Round 11. Berto injured his right shoulder early in the fight against Karass and underwent surgery to repair the torn tendon in August 2013. He didn’t resume fighting until September 2014, when he won a 10-round unanimous decision over Steve Upsher Chambers in Cincinnati. Andre Berto punishes Josesito Lopez with a right hand during their fight in Ontario, California, on March 13, 2015. Berto continued his comeback against Josesito Lopez on March 13, 2015, fighting on the first Premier Boxing Champions card on Spike TV. Competing practically in Lopez's backyard at Citizens Business Bank Arena in Ontario, California, Berto started slowly as his opponent won the early rounds. Berto picked up the pace in the fourth and began to hit Lopez with pinpoint precision. Utilizing both his power and speed, Berto dropped Lopez in the sixth with an overhand right. Lopez continued after the knockdown, but Berto floored him again seconds later with another right, prompting referee Raul Caiz Jr. to stop the fight and give Berto his 30th professional win.